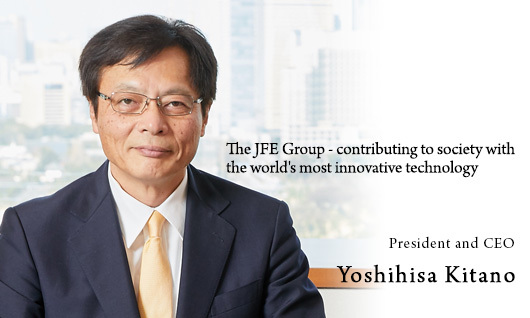 The timeless mission of JFE Steel is to contribute to society with the world’s most innovative technology for unique and highly functional steel products. Steel has long been a key, basic material for human civilization and will surely remain indispensable far into the future. As a steelmaker, we recognize our responsibility to address pressing needs in modern society, including safety and environmental protection, by developing world-leading technologies and products. Many countries are using great amounts of steel to support their growing economies and national development. To supply global customers on a timely basis, we are expanding JFE Steel’s production bases and sales networks both in Japan and overseas. We aim to build on our long-term, mutually beneficial relationships with customers by reliably supplying them with products backed with advanced technologies and tailore services. JFE Steel is hardly a stagnant old-economy company. Indeed, we highly value the vibrant contributions our younger workers make as they inhert the extensive knowledge and skills of their predecessors. The source of our technological strength has always been the talent of our people, so our seamless, ongoing development of innovative, high-quality steel depends vitally on nurturing younger employees with the skills they will need to take us into the future. As we strive toward a new era, we pledge to build ever-stronger relationships with our customers, host communities and other valued stakeholders.